If you are looking for a spring mattress, you are among the broader group of population and the most widespread choice, due to its durability and support. It is the most widespread technology and it has evolved the most. Its reactivity to heat and pressure can create an exact profile of the contours of each person. Permits the circulation of the blood, which in turn reduces the changes in sleeping positions, improving the quality of sleep. The sensation of weightlessness it offers helps create a more favourable environment for sleeping. This technology has changed a lot and its performance has improved a lot, providing further area-focused support and durability. The second big change is its combination of different foams. As a result, the firmness provided is incorporated with padded materials, with the aim of guaranteeing maximum adaptability. This way, we achieve maximum comfort hybrid mattresses. The most advanced, like Normablock. A row of the mattress, which covers from the head to feet, is made with a single continuous steel wire. It features a reinforced lumbar area that helps it adapt better to a person's weight distribution. It has a high durability due to not having any joints; there are no sections unlike the other two types of spring mattresses. It is Pikolin's latest innovation. They are hybrid mattresses. Why? Because in its interior it combines continuous coil system innerspring units and strips of HR foam cushioning inside. It is a unique combination of the best of both worlds: springs and foams. In addition, Normablock continues to be the most technologically developed spring block thanks to its support, ergonomics and durability. 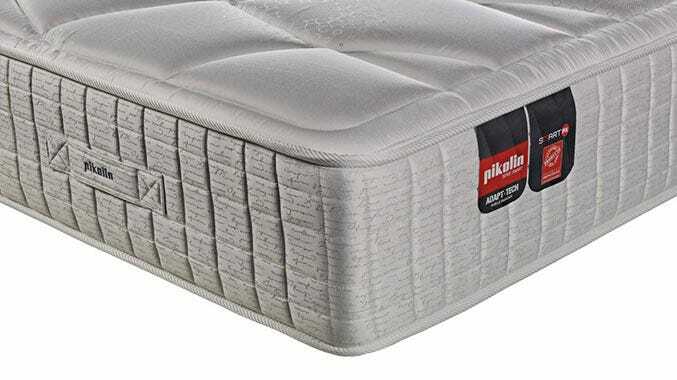 This accompanied with multiple interior comfort layers make Pikolin's Neo, Elite, Active or Practik series genuine benchmarks of comfort. Invented in 1900 by James Marshall. They are springs in the shape of a barrel that are individually wrapped in fabric. They provide progressive comfort. Their firmness is lower than in continuous coils systems. They are the less technology driven, and they were initially used in car seats already in the nineteenth century. In the shape of a double inverted cone, narrower in the centre and joined individually, they are subject to a higher risk of breakage due to their configuration. They are used in bottom-range mattresses.